I guess it all started when I speared my first northern pike – what a thrill. The only thing better was to spear one lured in with a decoy I made myself. I made more decoys to spear more fish and found out I liked making decoys as much as spearing northerns. Well, soon enough, my decoy/lunch box had more decoys than lunch. So I laid off the making and stepped up the spearing. Then when the fish tore them up and they scraped up against each other in the lunch box and they rolled around on the floor of the dark-house they weathered with an aged, charactered, antique patina. 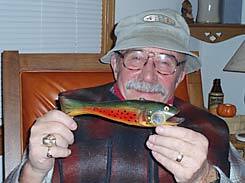 It wasn't long before friends paid more mind to my spearing decoys than my fish stories. Said they’d like to have some to set on the mantle – said they were folky. So I laid off the spearing and stepped up the carving. 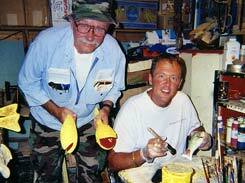 Now I've been making DFD (Duluth Fish Decoys) spearing decoys for longer than I want to admit – they say you’re only as old as you think you are. Being on the north side of seventy, I been making them for… let’s just say a long time. I don’t know a web site from a stick of fire wood but the kids and grand-kids have been pestering me to get one for years. 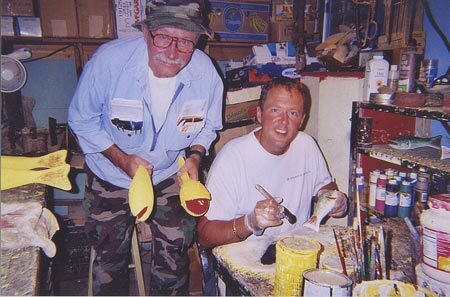 In fact, I told Jim, you make the web thing and I'll make the decoys that go on it. But with the demand being more than I can keep up with, he's been making them right alongside of me - just like when he was a kid. Great to keep it in the family - two generations of DFD. Who'd of thunk it. What a hoot it’s been to create something so enjoyed by others. Along the way our DFD decoys have ended up in The American Museum of Folk Art, on a limited edition print, in a governor’s mansion, in Hollywood actors' homes, in fishing decoy books, with interior designers, in art galleries, on a DVD, and now in a coffee table book devoted entirely to DFD. What a hobby it’s been – what a blessing of God. I hope to continue as long as my health holds out. 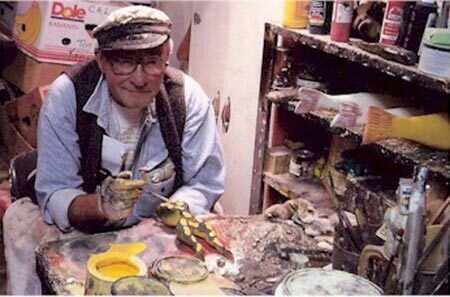 Lo, these many years later our DFD spearing decoys are still hand-crafted with that aged, weathered, antique patina. As with all folk art there’s no two alike. The pictures give the length of the decoy but it may vary by a half an inch. They all have glass eyes and are hand painted with a brush – no air brush for us. The lead belly weight is stamped DFD. They all function as working decoys – though most people prefer to set them on the mantle. The picture above is the limited edition print (by Ronnie Wells -also available on post card) of twenty one of our most common decoys – “the print decoys”. The DVD mentioned above shows many of the “early years” decoys. 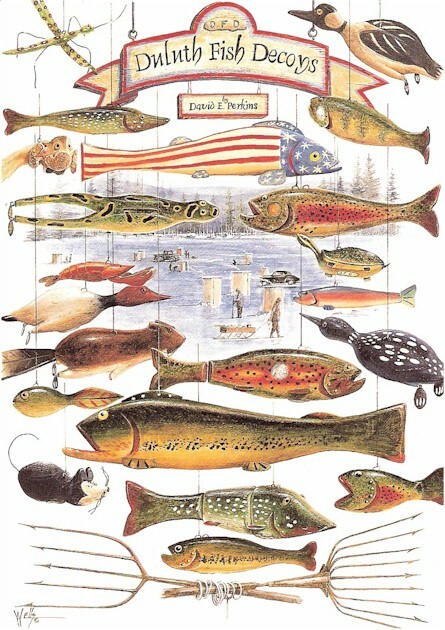 The Duluth Fish Decoys book (click here) is a hard covered, full color coffee table book of both early and current work. Click here for individual pictures of the “21 Print Decoys” with titles (and approximate length) to identify. Also newly available is the limited edition State Quarter decoy - click here for details. call - WE LOVE TALKING DECOYS (218) 341-9338.